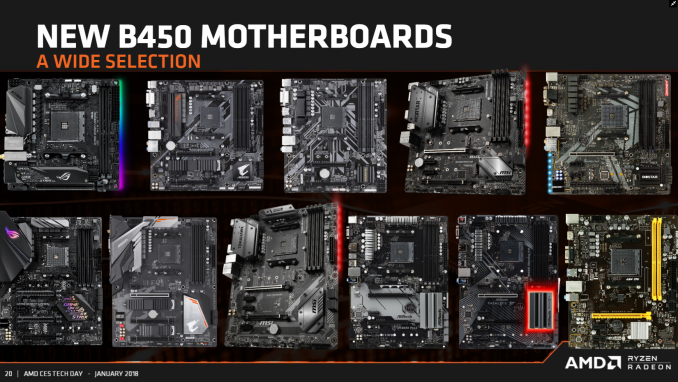 While there are over twenty-five motherboards to select from on the B450 chipset, finding the right one with the right balance of features can be somewhat confusing. Selecting based on certain criteria can help narrow down between features such as dual M.2, integrated WiFi and pricing; some shine above others in the specifications whereas others may not have a specific desired feature. The B450 chipset is essentially a B350 first generation refresh which has given manufacturers the opportunity to refine and define; for example GIGABYTE has focused their attention on specifically on defining their Aorus gaming brand to users and has used the B450 chipset to implement the new naming schemes. Other vendors have made slight aesthetic adjustments, while others have added more premium componentry to their offerings in exchange for a slightly higher MSRP; or in a lot of cases, remained with the same pricing structure. Each vendor seems to have a good range of products on offer, from $70 to $130, with at least one board in the range with Intel Ethernet, Intel Wi-Fi, and the top end codec. In order to get all three, it looks like the minimum price will be $120. "Strix B450-F Gaming ..... Also present is a duo of M.2 slots with both having support for PCIe 3.0 x4 M.2 drives, while the top slot which supports both PCIe and SATA drives up to a size of M.2 2280 (22 x 80 mm), the bottom slot only supports PCIe 3.0 x4 drives with a sizing up to M.2 22110 (22 x 110 mm)."